The Wirth family is a local Sacramento Veteran family. Mark Wirth served 6-years in the U.S. Air Force. He and Emily grew up in poverty with parents who suffered from addiction issues. They were the first in their families to graduate from High School and are both working towards their nursing degrees while raising their two children – 7-year old Natalie and 3-year old Troy. They are currently living in an overpriced rental home and paying over 50% of their gross income on rent alone (over the past few years rents in Sacramento have skyrocketed and the city has seen double digit percentage increases in rents across the board each year- making affordable housing more and more difficult to find and more families paying over 50% of their income on rent alone). We, along with our full home sponsor Health Net Federal Services, surprised the Wirth family with the news they had been accepted to get a Habitat home at a Sacramento King’s basketball game on November 9th (right before Veteran’s Day 2017). You can see the surprise, as well as their video testimonial which was played prior to the announcement. The Wirth’s were selected from a pool of local Veteran families who applied this Fall and went through a stringent application process. 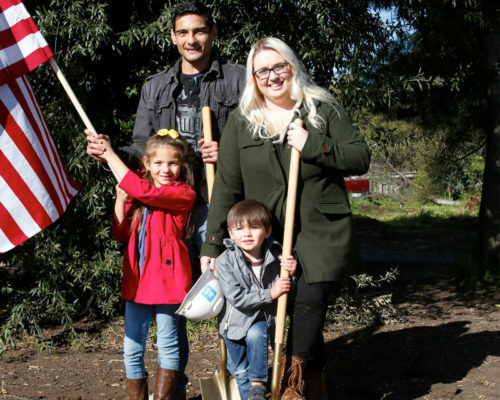 Their home will be our local Sacramento affiliate’s first ever Veteran home build. We broke ground on their home a little over a week ago and plan to complete their home and turn over the keys this fall so they can be in their home by Veteran’s Day 2018.